If you're like me, sometimes you need a lunch plan that's nearly as quick and convenient as fast food for your kids, preferably something they can make themselves. This is one that E and I made last night. My husband found the mini pepperoni and was laughing about it, but I spotted it and thought "Mini pizzas all in scale!" 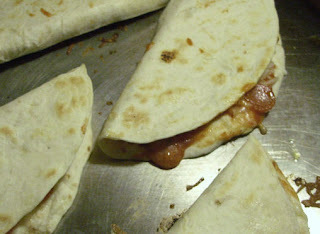 which is a great idea, but what we wound up doing was pizza quesadillas which wound up being a hit with the teens and with my husband. The nice thing about the mini pepperoni was that at no point did anyone pull out one with a bite and splatter pizza sauce all over themselves. (Or am I the only one who does that?) Chopping regular slices into quarters would work just as well. This barely even qualifies as a recipe, it's too easy, too fast. It's convenience food made with convenience ingredients, but it's tastier than frozen pizza and just as fast. You'll need whatever ingredients your kids like for pizza. This one was mozzarella cheese, pepperoni, and pizza sauce. I get squeeze bottles of pizza sauce, and when they are empty, refill them with a spaghetti sauce everyone in my family likes. You'll also need a package of small flour tortillas. 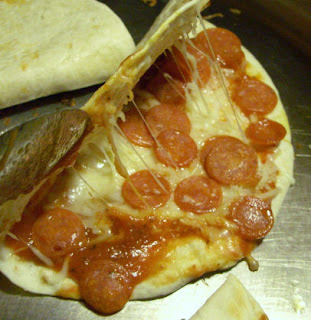 Put the tortillas in a skillet over a low flame, and spread them with pizza sauce. Add cheese on one half, and the pepperoni and other toppings on that half. Fold in half, and repeat until the pan is full. Turn the heat up to medium and cook them for a couple minutes per side. You can also microwave them, but my family likes the toasty and slightly crispy flavor you get from doing it on the stove top, and it really takes no time at all. If I was going to do it for bento lunches, I'd do them flat and top them with a second tortilla then use cute cookie cutters to cut them into fun shapes. Serve with a bit of pizza sauce on the side for dipping. I don't much like pizza, but I did like these. The sauce I used wasn't sweet, and I used a decent quality cheese. E said it was fantastic. But take that with a grain of salt, she thinks those awful cardboard/ketchup 60¢ frozen pizzas are good when I let her get them. It also makes a good meal for kids who are just learning how to cook. They can make it and serve it with salads.